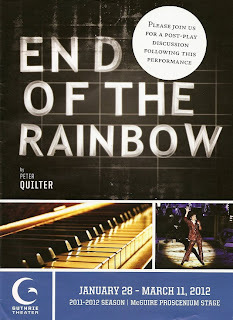 End of the Rainbow is the second show about Judy Garland that I've seen this season. The first was The History Theatre's Beyond the Rainbow, which was set during Judy's famous 1961 Carnegie Hall concert. It was a wonderful production with two actors beautifully portraying Judy, one in the present (1961) and another in memories from the age of 4 throughout her life. At the time I wrote: "I can't imagine anyone capturing Judy better than Jody Briskey and Norah Long." But that was before I saw Tracie Bennett. Not that I think any less of Jody and Norah's performances, but this is a different Judy. Only seven years later but in a much darker place - broke, desperate, bitter, and angry, and less than a year away from her death. Tracie holds nothing back in a portrayal that is fearless, fierce, heart-breaking, and completely mesmerizing. Similar to Beyond the Rainbow, End of the Rainbow is set against the backdrop of one of Judy's famous concerts - a five-week run at the London cabaret "Talk of the Town" in 1968 (here I am, back in 1968 again). It turned out to be among her final performances. Her new beau/manager and soon-to-be husband Mickey Deans arranged it and works hard to get her to complete her obligation sober. When that doesn't work he gives in and eventually enables her addiction, anything to get her up on stage. This is a woman who was fed drugs by the studio from a young age and probably couldn't have gotten sober without a serious and lengthy in-patient medical intervention. And more importantly, she had to want it, which she didn't seem to at this point in her life. In response to Mickey and her pianist cajoling her, she says, "I won't be clear of it because I don't think I need to be clear of it!" Tracie Bennett has been involved in this project for ten years, as I learned in the post-show discussion. In its earliest form, it started as a show at a pub for which she was paid "70 quid a week." She had a lot to do with the creation of the piece as it now is, including choreographing her own drunken dance stops. Since the show was first performed in London where it takes place, she spoke to several people who had been at Judy's concerts, so much of her performance is based on eyewitness accounts. Tracie is vastly different from Judy, but just as entertaining a character. As Judy she's completely convincing and authentic, throwing herself physically, vocally, and emotionally into the role. She talked about how she made a conscious choice to almost go over the top, because that's what Judy did. Judy was playing a role onstage, and Tracie plays the role of a woman playing a role. There's no way she won't be nominated for a Tony (the show moves to Broadway in March) for Best Actress in a Play. This is not a traditional musical, but a play with music; while the music is great and she sings with that familiar smokey vibrato, both a cappella and with a six-piece band, it's not the focus of the show. The small supporting cast is great too. Broadway veteran Michael Cumpsty is completely charming as her Scottish pianist, not a historical character but an amalgamation of many pianists who worked with Judy. As they say in the show, "Judy Garland's pianist is a wider job description." Anthony is also her friend, confidant, and sponsor, even offering to move her into his home and take care of her. He represents the importance Judy has to the gay community and the gay rights movement. Judy's young fiancee Mickey Deans is played by Tom Pelphrey, two-time Emmy winner for his role on Guiding Light (although I know him for his brief but memorable role on my beloved soap As the World Turns). Tom is one of those great NYC soap/theater actors, a dying breed due to the demise of the New York soap. So I'm very happy to see him get his Broadway debut. He does a great job as the new man in Judy's life who's way out of his league (as Tom said in the post-show discussion, wearing a NY Giants shirt on Super Bowl Sunday like a good New Yorker). Mickey thinks he can control Judy and help her out of her addiction and back into stardom, but that's an impossible task. Tom is a good match for Tracie, countering her every move, and affects a great hearty laugh as Mickey (mostly at his own jokes). Like the Kander and Ebb musical Scottsboro Boys in 2010, which also came to the Guthrie just before it hit Broadway, this is your chance to see an almost guaranteed Tony-nominated production before it gets to Broadway. The elegant set and period costumes (designed by William Dudley) were built at the Guthrie and will be traveling to NYC along with the cast. But be forewarned, this is not a pretty picture of the Minnesota darling. She smokes and swears and throws things. It's an honest portrayal of a woman at the end of her rope, worn down by years of drug addiction and fame and expectations. But she can still sing and entertain a crowd! End of the Rainbow is playing at the Guthrie through March 11; Broadway previews begin a week later with the official opening on April 2. "It's a terrible thing to realize what you're capable of, and know you'll never get there." So glad you liked it! I've heard some great reviews, especially about Tracie Bennett. I'm seeing it in New York in April. I'm kind of fascinated by Judy Garland. Like a lot of people, I grew up watching The Wizard of Oz and that's how I think of her, frozen in time. The way her life ended was so sad. Anyway, I'm really looking forward to it. hi esther. i think you'll love it, but might come away with a different image of judy, and a better understanding of her as a person.